One of the Damai Fleet boats Damai II offer to discover underwater treasures of Indonesia. Damai II designed with a sense of traditions. The boat got 7 air-conditioned cabins to accommodate 14 passengers. Four cabins located on the lower deck.These rooms are comfortable, each has private showers, supplied with head lights and wardrobes. Cabins on the main and upper deck are larger. Upper deck stateroom has also big portholes and private access to sun deck. A trip on Damai II is a perfect way to relax. This boat has several sun decks, where passengers can spend time in between dives and enjoy the warm sun. Boat's salon is comfortable for chatting with other divers after diving day. Damai’ II dive deck is situated on the main deck. It’s comfortable to prepare for the dive. To maintain gear after a diving boat has rinsing tanks. Also, the boat has a separate camera room. Crew team of Damai II cares about safety on board. The boat equipped with first aid kit, life vests, and emergency rafts. Damai II Liveaboard suits for photo enthusiasts. Boat equipped with a camera room to work with photo equipment. It was enlarged since the last renovation. Indonesia is a true paradise for photographers. Its marine life is rich/ Divers can capture sharks, mantas, lots of corals. Picture made on Indonesian diving destination is colorful and extraordinary. Damai II runs the most attractive itineraries of Indonesia. It’s Raja Ampat, that can offer to see one of the biggest amounts of fish and coral species. This region is well-known between divers for its richness and variety of marine life. 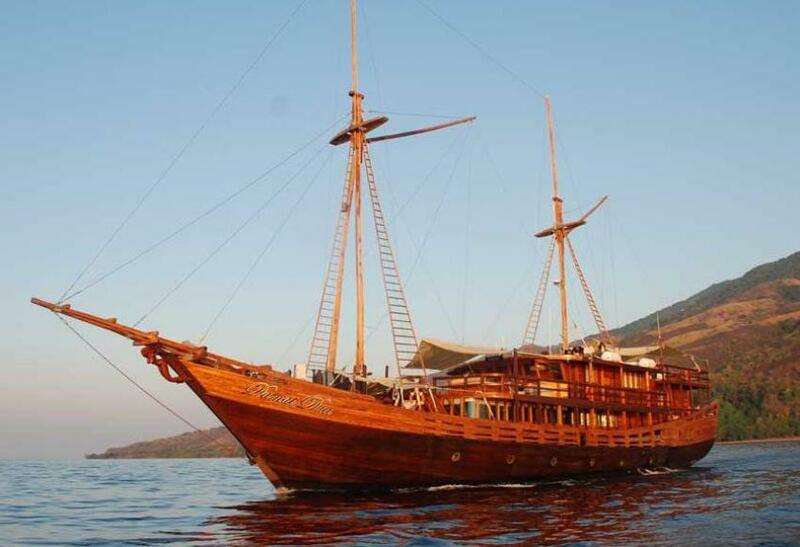 Also, Komodo Island can be visited during the trip. Sunfish, mantas, and dolphins are common visitors of its dive sites. Of course, this island is known in a first place, for big lizards Komodo dragons, that inhabits this island. Cenderawasih Bay is also on the list of Damai’ II trips. Maine feature of this destination is whale sharks. There is no other destination where you can see this creature in groups. Usually, they can be seen only on their own. Indonesian diving is possible thought the year, but high season for diving may depend on a region. Komodo is best in April. Raja Ampat best season is during the months of October until the end of April. Chances of meeting famous Indonesian fish Mola Mola is better in August. Mantas are regularly seen from October until April. Enjoyed diving on the Damai 2! Comfortable dive tenders, attentive dive guides, and all wetsuits were washed and hung to dry after every dive by the crew. Cameras were handled with care. If there was anything you needed you only had to ask about it and it was done! Will definitely be coming back to the Damai 2.